I’ve gotten a lot of questions about if wearing an artist glove with your iPad makes a difference. IT DOES. Mainly it helps the side of your hand slide more easily across the screen and prevents smudge marks from the natural oil of your skin which saves you time wiping it off. I wear mine all the time. They’re all kind of flimsy, but personally I recommend the Huion Artist Glove as they’re a good name, it’s simple, and inexpensive. Also, if this post has been useful, you can support me by checking out my comics that I've created with these apps on Gumroad by clicking here! Thanks! While these are all Vector-based apps, there is a separate post for Raster-based apps called, Best Drawing Apps for iPad, please check those out too. Concepts is an app that I don’t think gets enough love. 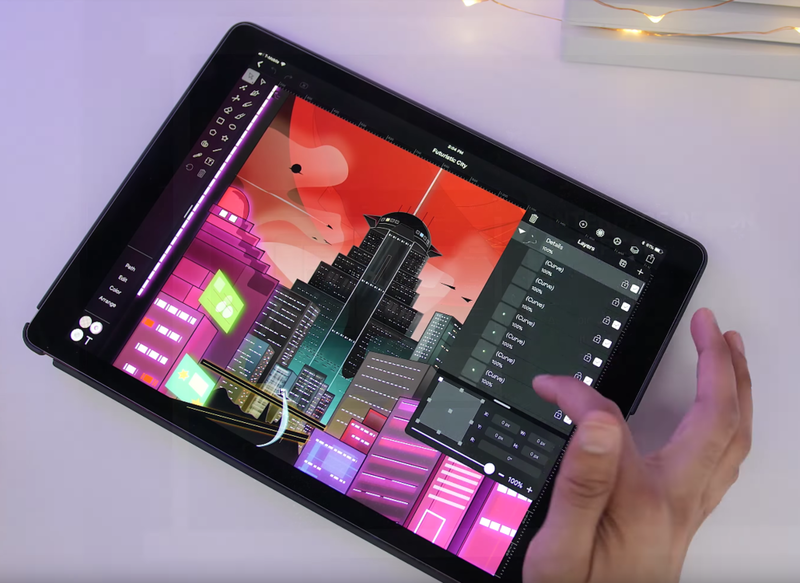 Whereas Autodesk Sketchbook blends an app that can work for artists and designers alike, Concepts steps further and farther into the designer field. The most common use-case scenario I’ve seen is people using the app for technical sketching and industrial design. The developers have been continually pushing out improvements in the overall design of the app and adding new features on a regular basis. Concepts can handle creative artwork reasonably well, but it is exceptionally well-suited to architects, home renovators, and landscape designers. Tools are nested in an intuitive wheel design which takes a little getting used to, but is pleasing to use. The app itself is free and that gives you a lot of things to play with. There are also a few things you might potentially spend money in the Pro Shop. You can purchase a variety of extra features so as Infinite Layers and extra export formats like PSD for a few bucks. Not bad at all. Concepts also stocks it’s own Marketplace which supplies a variety of clipart-like objects, many of which cater specifically to industrial and product design as well as extra brush sets. Should you wish, you can subscribe monthly or yearly to get access to every brush, object, palette…everything they offer in the Marketplace and the new stuff as soon as it releases. Vectornator Pro is about one thing and one thing only: graphic design with vector images. While Affinity Designer only just recently appeared on the scene, Vectornator Pro has been around for a while. I’ve seen the app continuously improve and become a viable competitor with any other desktop vector software that’s out there. The current iteration of the app has a gorgeous UI design that takes advantage of iPad Pro’s touch capabilities. Besides all the features the app has, probably the most compelling thing about the app is that it appears to have gone permanently free. 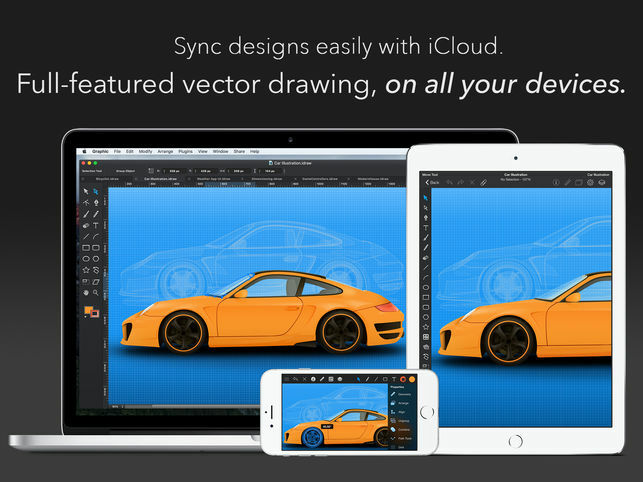 The original price of $7.99 wasn’t much to get in a tizzy about anyway, but considering that the big name in vector software on the iPad is Affinity Designer that sells for $19.99, anyone looking to test out the iPad’s capabilities for graphic design should definitely give Vectornator Pro a try first. Graphic is an impressive and affordable vector-based design app that’s actually available for both of Apple’s platforms: iOS and macOS alike. Most graphic design applications can have a pretty big learning curve, Graphic does an exceptional job at trying to bridge that gap in knowledge by providing a 116 page User Guide and Tutorial section for free. That may be compelling for those comparing it to the $19.99 cost of Affinity Designer and the $49.99 cost of the Affinity Designer workbook. Where I think Graphic might work particularly well where others are lacking is if you want to use the same application on your Mac as well your iPad to work with vector illustrations and get used to one particular type of workflow. The macOS version is $29.99, so it’s definitely not going to run you too much to pick up the app on macOS and iOS. To be sure, you can also do this with Affinity Designer, but Affinity’s versions are slightly more expensive, so you may want to take that into account. The Affinity suite of apps from Serif are incredibly impressive and seem to get more so all the time. They are quickly becoming many artists and graphic designers alternative to the expensive Adobe Creative Cloud as they are pay-one-time applications and are very reasonably priced for apps that are so fully-featured and capable. Affinity Designer is akin to Adobe Illustrator, it is a complex and quality vector-based application. Where the Affinity suite of software really shines is modern user interfaces designed for simplicity and ease of use. A vector app like Designer can do A LOT, the program needs to not make you toggle down into endless menu windows to find what you are trying to do. I think they’ve largely found many innovative was of solving these types of problems. The app though, to be sure, can be complicated, and is certainly not as intuitive as something like Procreate. But to be fair, it is a professional level design app that can do a hell of a lot more than Procreate. One of the standout features of Designer is the Pixel Persona, which is a raster mode built right into the app so you can sketch out your ideas before working in vector. This is genius. Another great thing about Affinity Designer is that there is a large and growing userbase so the app is very well supported with extra tools and user tutorials. There are a lot of quality official Affinity tutorials on their website as well and they also have created the well-reviewed Affinity Workbook which teaches the program through a series of projects. I’ve ordered this myself since it was on a 20% off Christmas Sale so I’m excited to start working on some pieces. 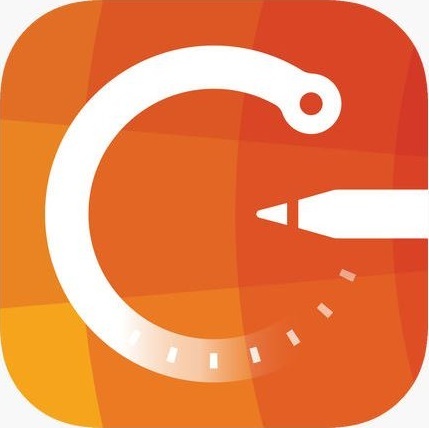 Inkpad is a simple and easy-to-start-using vector app. It has a very nice minimalist user interface that is probably more well suited to those just starting to work with vector design. I don’t mean that the app is incapable, just that the simplicity lends itself well to beginners. It might be the perfect choice for that burgeoning graphic designer in your family. I think it would be an ideal choice as an app to teach high school students vector design on the iPad. There aren’t any in-app purchases to unlock more tools, something that I can really appreciate. Interestingly, Inkpad is Open Source. It is well maintained and updated frequently. Assembly was built on a neat idea: have a vector design app where the shapes were already pre-created and users just picked and manipulated an extensive list of objects to create their design. The result being a really clever little app that has virtually no barrier of entry for simple graphic design. The app was severely hamstrung when it was changed into a subscription model to use the full features of the app. They want a laughable $3.99 a week, $4.99 a month, or $29.99 a year for an app that is kind of a novelty at best. Adobe Illustrator Draw is another in Adobe’s line of extremely dumbed-down apps for iOS so they can say they actually develop for the platform. Draw is essentially a vector-based scratchpad for jotting down quick ideas and then exporting them to a desktop application where you could do more work on them. Of course they design the app so this pretty much has to be a Creative Cloud app. So if you have a CC subscription and had an iOS device and didn’t understand the other options you had like the aforementioned apps, then I guess I could understand using this. Other than that, not really. Those are my picks for the top vector-based apps for iPad. I think we can safely say there are some extremely high quality apps that are worthy of professional graphic designers. Pair them with an iPad Pro and Apple Pencil and you have some fantastic options for design work. Thanks for reading!